Inspired by old video footage of Bono's late mother, the lyrics describe an attempt to preserve memory through film. 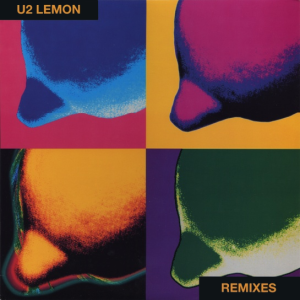 The song more than any previous U2 song, showcases Bono's falsetto skills, aided by atmospheric vocals from The Edge and Brian Eno. The song has been described as futuristic German disco. The music video for "Lemon" was filmed in black and white with a grid-like background as a tribute to Eadweard Muybridge. Muybridge was a photographer who was the first person to successfully capture fast motion on film, using his device, coincidentally named the Zoopraxiscope. Lemon makes reference to this in it's lyrics "A man makes a picture - a moving picture/Through light projected he can see himself up close"
Check out the lyrics to U2's song Zooropa.